Growing orange trees indoors is a great alternative to growing your own fruit when you live in a climate with freezing-cold winters. Citrus trees are rather frost-tender, often dying when temperatures reach prolonged freezing levels during the winter months. By growing your orange trees indoors, you can still enjoy fresh, homegrown oranges, regardless of your region’s climate. Caring for your indoor orange tree takes some time and effort, but no more than the level of care that an outdoor orange tree requires. Also, many dwarf orange tree varieties are available, which are well-suited to indoor growing. 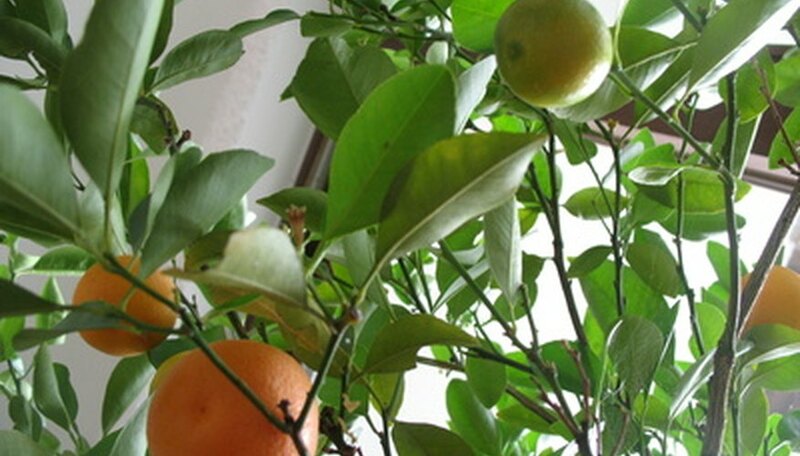 Place your orange tree in bright indirect light, such as beside a sunny window. Avoid exposing your orange tree to direct summer sunlight through the glass, but place the orange tree outdoors in a sheltered but sunny spot during the summer. Water your orange tree deeply and thoroughly to moisten the soil down to the bottom of the container whenever the top 1 or 2 inches of potting soil dries out slightly. Watering the orange tree once or twice a week during the spring, summer and early autumn is usually sufficient. Mist your indoor orange tree or place the pot on top of a drainage dish filled with gravel and water to raise the humidity levels around the tree, especially in winter when indoor heating causes the air to dry out. Mist your orange tree once every three days or so during hot, dry weather and throughout the winter months. Feed your orange tree once each week during its active growing season with a liquid citrus fertilizer. Feed your indoor orange tree once every two weeks with a “winter” citrus fertilizer from October through February or early March. Follow the dosage instructions on the label. Prune back your orange tree’s branch tips when the new-growth branch reaches about 4 to 6 inches long. In February, prune away and weak or damaged larger branches on the orange tree. Repot your orange tree during the growing season when the tree’s roots fill the pot. Repot the tree into a container that is the next size up from the current pot, planting the tree in a slightly acid, loam-based compost potting mix, such as a mixture of peat moss, organic compost and some sand or grit. Acclimate your orange tree to its indoor and outdoor environments by placing it in a shaded spot outdoors for two or three weeks before either setting it outdoors in a sunny spot for the summer or bringing it indoors for the winter. If you're trying to control your orange tree's size, don't repot the tree into a container that is larger than about 17 1/2 inches in diameter. Instead, remove the orange tree from its current container and trim back the overcrowded roots by about 1 or 2 inches around the edges of the root ball. Then, return the orange tree to the same container. Give your indoor orange tree a rest in the winter by placing it in a cooler room that's away from any heating vents. Reduce watering of the tree so that you're watering just enough to prevent the soil from drying out completely.